The sanitary regulating valve is a type of control valve to adjust flow rate and pressure of downstream mediums. Found in most sanitary production lines, these pressure regulators allow greatly improve safety and quality control. The series of valve is major let the medium reach the purpose of reversing or end stop, because the goods tightness and cleanability, they are extensively use to different sanitary industry areas. Manually set the valve opening degree to make a pressure drop to the medium passing through the valve, thus regulating the medium pressure, flow and temperature of pipeline system. * Compared with the ball valve, butterfly valve and other valves, it produces a more significant pressure drop. * Conical valve plug inside. 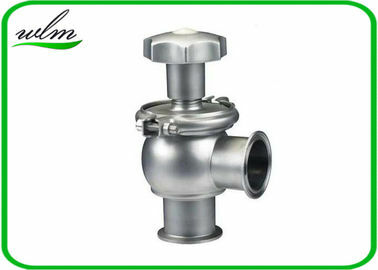 The series of valve have two type valve, that is the cut-off type and reversing type, the cut-off type can made of two or three pipeline connector, the reversing valve can made of three to five pipeline connector, their variety full satisfied the needed of market.